Flexible Innovations Limited, a leader in the development of advanced materials, announces an egripsÂ® custom designed to perfectly fit the OGO, a dedicated text, instant messaging, and email messaging device sold by Cingular/AT&T Wireless. Flexible Innovations Limited is selling egripsÂ® for the hot new OGO text messaging device from Cingular/AT&T Wireless. Now you can personalize your text messaging device and get a great feeling grip as well. egripsÂ® are stylish, super grippy appliquÃ©s that adhere to your OGO, giving it a unique look and providing a better grip, to keep it from slipping out of your hand or off your console. egripsÂ® for the OGO feel great to hold and are available in designer colors and patterns. egripsÂ® is made of an easy to clean, durable, silicone based material that also protects your OGO from scratches and scuffs. With an egripsÂ® applied to your OGO, you can individualize your OGO and keep it securely in your hand at the same time. Visit http://www.egrips.com for more information. egripsÂ® for the OGO are priced at $12.95 for the full set and $9.95 for the short set. They are available at http://www.egrips.com in black, silver, cheetah, chartreuse, pink sparkle, and purple sparkle designer patterns. Flexible Innovations Limited, a leader in development of advanced materials, created egripsÂ® technology, a very thin silicone based product with unique features. egripsÂ® safeguard mobile phones, smart phones, PDAs, and other handheld electronic devices from potentionally damaging falls by giving users a better grip. With egripsÂ® attached, devices donÂt slide out of userÂs hands or off the edges of slippery surfaces. egripsÂ® work with a wide variety of handheld devices including cell phones, smart phones, Palm Pilots, OGOs, Pocket PCs, portable CD and DVD players, remote controls, cordless phones, GameBoy units, GPS units, messaging devices, MP3 players, notebook computers, photography equipment, portable medical equipment, professional grooming products, scanners, and two-way radios. Visit http://www.egrips.com. OGO is a hand-held device sold through Cingular/AT&T. 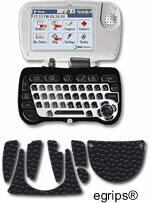 It features a clam shell design with a full QWERTY keyboard for easy typing and a color screen. Now you can chat with any of your instant messaging friends, send an email to anyone, and text message to both domestic and international numbers with one device. Service starts as low as $17.99 per month for unlimited usage, available nationally in the OGO Service area.